So much has been written in the short time since Steve Job’s death, that I will refrain from expressing my personal grief at his passing. I just finished his biography by Walter Isaacson. I read between cases and into the night. The most recent memory I have of Steve (he is now all of ours to refer to personally) is watching his introduction of the iPad2, which I watched on-line this past spring. 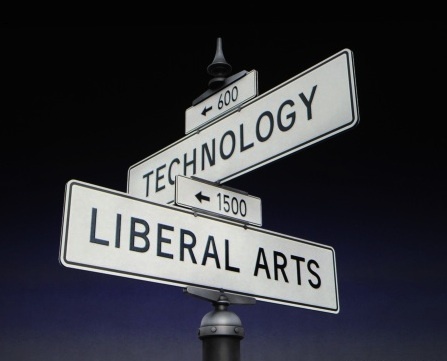 The final image was what stuck with me –the intersection of the liberal arts and technology. That is why Apple products are so wonderful –they liberate the individual to perform insanely great things with computers that were frankly difficult or impossible before. It has also inspired me to think about health care’s relationship to technology. Modern health care is about delivering technology. I can now repair an abdominal aortic aneurysm with stent grafts delivered via two small incisions smaller than the width of my pinky where traditionally, I had to make a long incision on the belly. These patients go home the next day. Small computers embedded in pacemakers can sense arrhythmias, correct them, and send reports to physicians by internet. Drugs can be tailored to the genetic makeup of tumors. You can have your genome scanned for disease risk. But in the practice, on the back end, health care is very analog, very dependent on paper and pen, dictation, and text. The best medical notes read like compelling tone poems but can only be composed by direct speech or penmanship. The notes generated with the assistance of computers end up formatted for other computers and insurance companies. I generally skip to the human generated summary section and plan of care, yet even here, most EMRs (electronic medical records) try to parse meaning by stuffing what is analog into digital cubbies. Electronic medical records are ripe for reimagining. When I want to know the temperature in Orlando, where my father lives, I can ask my smartphone, “What is the weather in Orlando, Florida?” and the temperature pops up along with weather forecast for today, this week, and so on. My email, my contacts, my friends are instantly available. When it comes to my patients, it is an entirely different story. The problem is that hospital information services serve many needs and therefore devolve into the least common denominator in order to be used in an infinite variety of scenarios. Often, during the course of decades, legacy systems and databases serving different aspects of patient care create an alphabet soup of programs, each with their own security needs and access methods. For example, in most hospitals, to look up blood tests, you have to log into the computer, then log into several layers of programs then look up the patient, select the correct admission, then select the laboratories -all the while remembering multiple long and complex passwords which you are not allowed to write down. You repeat the process to look up x-ray images, and chart notes from other physicians if they happened to have been scanned in. I can find out the location of every Starbucks in Manhattan and have them mapped out, but checking patient information is a trip back to 1985 in terms of technology. On top of all of this, hospital computer programs are simply ugly. Steve would not approve. Steve’s philosophy of vertical integration -of creating the software, hardware, store, and services, created simplicity for the end user. It made the technology work magic by being carefully thought out from top to bottom. Simple takes a great deal of effort, but the returns are clear. What a great day it would be if I could just ask my smartphone, “What is Mrs. Smith’s potassium over the past week?” and get an answer. The answer, of course, is to begin the work needed to get to that point. And that is the great lesson in Steve Job’s life -not fortune, nor influence, but that beautiful simplicity takes a great deal of focus and effort. Thank you Steve for showing us how. 12 Gifts for the Surgeon to Get for Him/Herself. Mobile Wifi. This comes in many different forms and is offered by most carriers. It can be purchased as USB stick for a computer –I don’t recommend this as it is the most limiting form of mobile Wifi. The mobile Wifi hotspot can be purchased as a small cigarette boxed sized item (in how many years will that description become obsolete? ), and allows for up to 5 devices to be on the network. While this is nice, it requires a separate contract, and doesn’t make sense if you already have a data plan for a smartphone. Most Android phones allow Wifi tethering and this is the most compelling reason to get an Android phone despite its inferiority to the iPhone in most other ways. 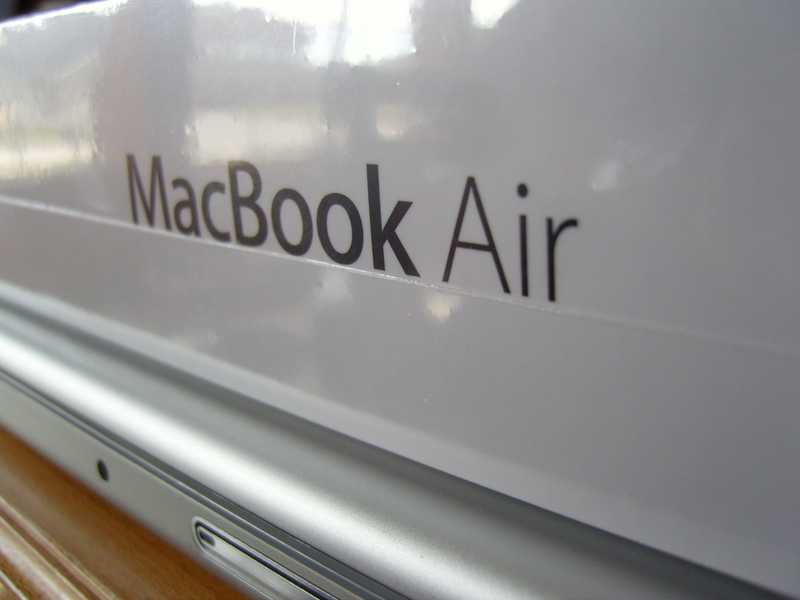 I have a Droid 2 on Verizon, and despite its failings as a smartphone, it is a wonderful Wifi hotspot, allowing me to use my Macbook Air, iPad, and iPod Touch 4g. I’ve even used Skype on my iPod Touch 4g to make international calls which were clear as a bell and cost only pennies per minute. How nice is it? Going to our rural clinics, the 2 hour drive is made productive and bearable with Wifi in the car (with my assistant driving, of course). USB recharging batteries –These are largish lithium ion batteries equipped with USB ports specifically for the recharging of gadgets that recharge via USB cables. There are many varieties and flavors, but I recommend the largest you can get for the price –you will never regret it. I found an Energizer branded cell that will recharge my iPad and still have half the power left. It is great not having to plug in at the airport. I can recharge with both battery and gadget in the carryon. One company even had a battery that would recharge the Macbook via repurposed charger cables, but Apple got a cease and desist and these batteries are no longer available. The reason why they should be large large capacity is because the charging adapters for them tend to be bulky and I leave mine home. Laptop Bag –These vary from bulky bags that go to the maximum limits of carry-on-ability to to slender sleeves. I own a range of very functional bags that allow for just enough capacity while not being bulky. The best of them is the Brenthaven backpack (link) which allows for bulletproof protection while having more than enough compartments for a laptop, a second laptop, an iPad, a digital camera, an iPod, headphones, memory cards, a smartphone, a backup battery, the cables and chargers, pen and paper. The most stylish bag (my wife calls it the man purse) is a Kenneth Cole laptop bag in black leather. While the Brenthaven bag says, “GEEK,” the Kenneth Cole bag reeks of style (link). Watch –Watches are indispensible tools for a physician. First and foremost, the date and time are required elements of a doctor’s note. A watch with a second hand is indispensible for checking heart rate. And a surgeon has to look presentable in scrubs, and the watch is one of the few personalizing items that I think a surgeons should choose with some thought. The problem with premium watches and surgeons is that the surgeon has to take them off while scrubbing for an operation. There must be at any given time some combination of Rolexes, Tag Heuers, and Omegas in hospital laundries across the country. I have become a big fan of the great looking, highly functional, cheap watch. The two best are the Timex T45951 Expedition series alarm watch which is a big chronograph with a handsome leather band –other colors are available, but the cream faced one with tan leather band is only 50-65 dollars and cheaper on sale at Amazon. It has the Indiglo feature, and a nice beeping alarm that wakes me without waking my wife. It is comfortable enough to wear to bed. The other watch is the Casio MDV102-1AV Sea Analog Illuminator Dual LED Dive Watch. This is a beautiful watch that could be mistaken for a Rolex Submariner or the James Bond Omega. Even better, the LED on it is so bright, I use it as a flashlight. Cost? Currently $42 on Amazon. Pens –The surgeon can never have enough pens. The problem with expensive pens is exactly the same as expensive watches –they are waiting to be lost in the hospital tucked into a chart or left in the laundry. The best pens leave a permanent record in the chart and has blue or black ink. They have to be roller ball if carbon paper duplicates are still used in the hospital. My favorite? A box of UniBall Onyx pens in fine point. I used to prefer Micro, but found the Micro points to be less durable. The ink flows smoothly and authoritatively from these pens which I don’t mind losing. The other pens are personalized pens to give away. The federal rules do not allow for drug companies to give away pens, but there is no such impediment to physicians giving away pens. There are many companies on the internet that will personalize bulks of very nice and usable pens. CME on disk –The problem with CME conferences is that it’s hard to get the CME’s on short notice and air travel makes it fairly miserable to hike across country to get the 30-50 annual CME hours required by most state boards. There are many CME products available, but my favorite are SESAP for general surgery (link) and the UCLA update on Vascular Surgery (link). Both are available as print material and handy MP3 and video MP4 files, allowing you to take them on your iPod or in your car. And that is where your CME time is well used. I frankly enjoy the 30 minutes listening in the car. Legals Seafood Fish Chowder –There is no better chowder than fish chowder and arguably, Legals of Boston has, if not the best, at least the most convenient. You can go on their website (link) and order a gallon or a quart, and you’ll get it shipped chilled and ready to heat up and eat. If you can’t consume it all at once, you can split freeze it, or split the package into smaller portions and freeze. A bowl of fish chowder on a winter day after playing out in the snow is something special. You can try making it yourself, but you won’t get the correct combination of fish and flavor that was featured in the Bush (pre) inaugural. I’m at the Taking Control of Your Diabetes (TCOYD) conference in Des Moines where Iowa Heart Center/ Iowa Vascular Institute are holding a free carotid artery screening. This takes less than 5 minutes and gives an excellent view into the amount of atherosclerosis one has and finds stroke causing lesions. Am on the road to Ottumwa Iowa for my first away clinic there. 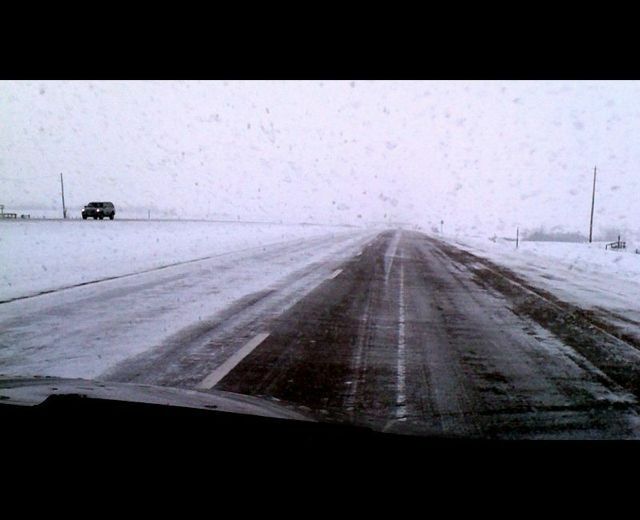 there was a whiteout ice storm the past two days and the roads were iffy, but too many people are waiting. Many cars in the ditch.Ottumwa is the home of the fictional Iowan, Radar O’Reilly. When I am not thinking golfism and supporting husband rights (in this blog categorized as naturalism), I am a vascular surgeon in Des Moines. I realized that the way doctors get the word out about themselves is inefficient, stilted, and unapproachable. Also, there is no transparency about what we do and how we do things. Therefore, I decided to open my previously closed blog – http://web.me.com/docpark. 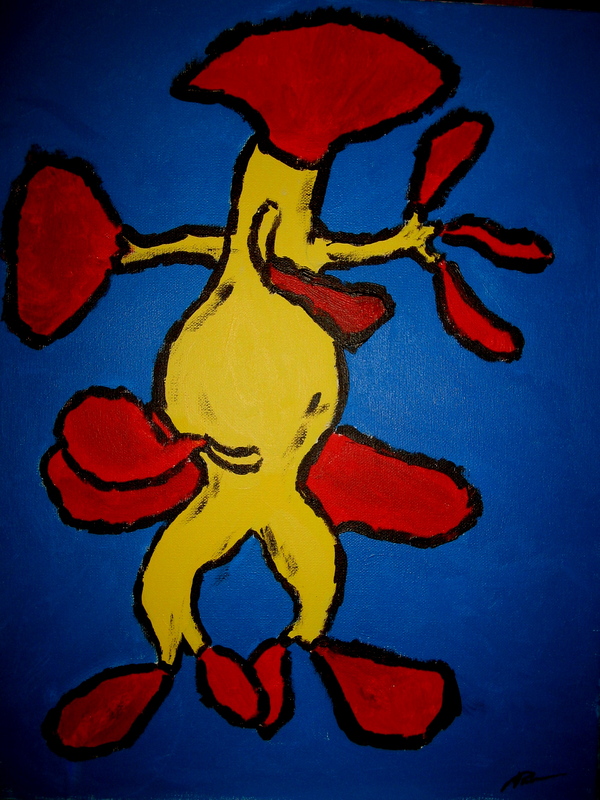 Above is a painting I did last year titled El Aneurismo, meant to be a market sign for a vascular surgeon.